If you’re looking for a new adventure, Royal Caribbean has something in mind. We were lucky enough to experience the newly reimagined Adventure of the Seas® at her new homeport, Cape Liberty, New Jersey. While there’s so much to see and do while you’re onboard, there were five gems that truly stuck out to us. 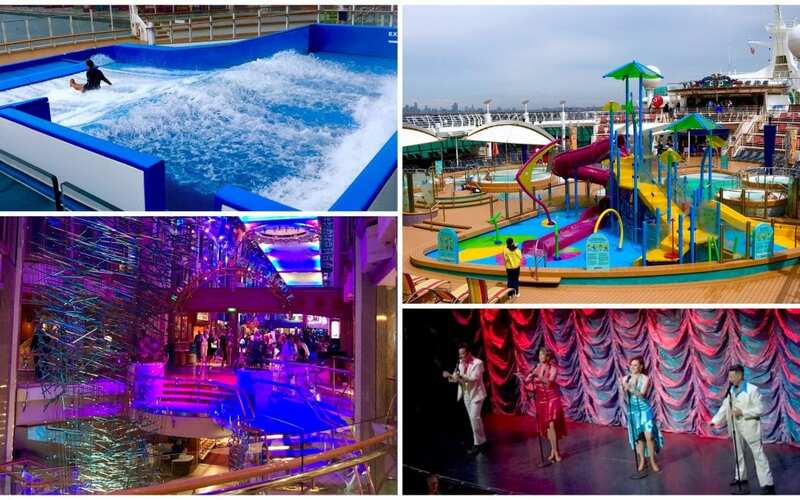 Continue reading below for our 5 must-dos while you’re onboard the Adventure of the Seas®. This new VIP lounge – exclusive to Grand Suite-level accommodations and above – has huge ceiling-to-floor windows that promise breathtaking views and ample space to tuck yourself away from the crowds. Make sure to start your morning right with continental breakfast or end the night with a nightcap – all complimentary. Is it wrong of us to assume that since we’re surrounded by water there has to be fresh fish onboard? Not at all! Right on the Promenade is the ship’s newest sushi restaurant, Izumi. This is the place to go for some of the best sushi at sea. Our picks are the Salmon Roll – can’t go wrong with a classic – or if you’re looking for some heat and decadence, the Champagne Lobster in Yuzu Wrap. We were glad to see this Royal Caribbean classic added to the Adventure of the Seas®. Since it was 68 degrees when we visited, too cold for us Floridians, we cheered on the few brave souls hanging-ten from the stadium. Arriba! Get ready to dance until late at Adventure of the Seas®’ latest addition, Boleros. This latin lounge/nightclub was packed when we stopped by. The music from the live band had everyone swaying their hips and raising their hands to the sky. We’re sure the mojitos helped too. If you have to do one thing before you disembark, it’s catching a showing for Royal Caribbean’s original production, Invitation To Dance. This dance show was filled with glamorous, frilly dresses, jaw-dropping dance moves, and live music that had you moving to the beat. The ballroom dancing duo – you’ll immediately spot them out from the start – had us completely sucked in. Trust us, this is one show you do not want to miss! Interested to see more of what we saw? Check out the pictures we took here. Feel free to share them on Facebook! For more information on the Adventure of the Seas®, click here.